This post is part of the larger Library Day in the Life project--I thought it would be fun for Collection Reflection to participate. Because I work with the public, I never actually get to spend an entire day doing collection development, so I'm going to describe the bits and pieces that got done over the course of this week in the midst of desk time, class preparation and teaching, and whatnot. Notes from the New Jersey E-book Summit. Full of good stuff! NPR asks "What book will fill the Harry Potter gap?" Why so few men join book groups. Interesting. In every "we no longer need libraries" article/editorial/letter to the editor/cave drawing in the papers recently, one of the reasons cited is that everyone will get everything on their Kindle/Nook/Cloud etc. It's ridiculous, of course, but that hardly matters when so many of the general public believe it to be true. "The Book", in its paper form, is still a pretty strong content delivery device. The million copy ebook club is still a pretty elite group, is it not? And until device costs come down (yes, MORE), and ease of access goes up, it'll stay that way. There are people who got devices for Christmas/Birthday/Mother's or Father's Day/Graduation who still have them sitting in the box because they have no idea what to do with them when they're unpacked. We have patrons calling us, not just with Overdrive questions (which is what we offer) but also with device questions....and not just how to use their device with Overdrive. Good Morning, lovelies. There were some interesting things on our new book shelves yesterday. 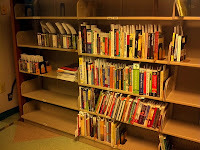 But first, how about a picture of our new book shelves. This is the holding place for "first copies" of items. They are taken from here by the catalogers and....um....cataloged. Then they are given to the processors to meet up with the rest of the copies and get stickered and bar coded and all that good stuff, then sent out to the branches and Central. Summer is a notoriously slow time. In the best of times, all those shelves would be full, and there would be overflow carts as well. But, as most people know, it hasn't been the best of times for libraries for a long, long time. But, for a random Thursday in July, that's not so bad. An interesting idea: Ebook subscriptions from Angry Robot. Are ebooks changing the way we read? I don't know. The Rita & Golden Heart award winners. Good Morning America thinks America will be reading these books this summer. Good picks, but where are the romance books? No one is reading rom this summer? So, I once bought ordered 85 copies of The Sheikh's Virgin Princess. I'm going to blame my fat fingers which were meant to hit 5, but hit the 8 as well on the number pad. And, of course, I was going way too fast, and didn't even notice it until after they were already ordered. Luckily, I caught it in time and we were able to cancel most of the copies. 23 actually shipped and were paid for, which is still considerably more than the 5 copies I intended. Of those 23, 12 are still in the system and circulating. A semi happy ending, but still.....85 copies. If you think that didn't send me into a mini panic attack, you are mistaken.